Markets were mixed last week, with the S&P and DJIA down less than 1%, while the NASDAQ rose1.4%. Greece continued to dominate international financial news. The Greek prime minister and his new cabinet survived a no confidence vote on Tuesday, and then Thursday an intra-day agreement with the EU and the IMF provided additional market support. Offsetting these Greek developments was the Fed, which lowered its projections for GDP growth for this year and next. Adding insult to injury, Bernanke admitted that he wasn’t quite sure why the subpar GDP growth was persisting. Broader eurozone concerns dragged the market down on Friday, with most averages again testing their 200-day moving averages (a technical measurement for analyzing price changes). Separately, falling energy prices are giving consumers a “tax-cut”. Also, note that the Fort Calhoun nuclear power plant in Nebraska is handling Missouri River floodwaters with aplomb. Kudos to the operators and the NRC. Despite continued Greece woes, the markets gained last week (albeit a tepid 0.04% gain for the S&P 500) – breaking a six week losing streak. 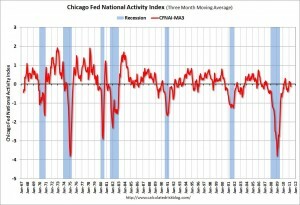 Yes, economic activity in the U.S. and around the world is slowing. We believe these are constructive factors which will ultimately provide a foundation for a recovery in the markets. The FOMC meets Tuesday and Wednesday this week. We suspect that they will downgrade their assessment of the economy; however, the FOMC will point to the transitory nature of the current soft patch. Summertime has traditionally been a challenging time for the markets, and this summer will likely be no different. We suggest investors enjoy the good weather and the activities of summer. A second measure frequently referred to is the put-call ratio which reflects the ratio of bearish options to bullish options written. 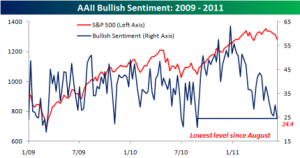 Here again we are reaching bearish extremes often associated with market turns. No guarantees but clearly positive data. There are plenty of reports this week to measure how the U.S. economy is performing. The CPI, retail sales, housing starts, leading economic indicators industrial production, and a consumer confidence index will have Wall Streeters busy. While growth has clearly slowed, we’re hoping the data will at least show slow growth this month. Stay tuned. U.S. equities posted another week of losses, bringing the recent selloff’s duration to 5 weeks. Despite the correction, major indexes are up year-to-date as follows: DJIA, up 5.0 percent; the S&P 500, up 3.4 percent; the Nasdaq, up 3.0 percent; and the Russell 2000, up 3.1 percent. Employment gains were less than expected, + 54k vs. + 190k net jobs created. However, the service sector of the economy is showing signs of strength with the most recent ISM non-manufacturing report improving 1.8 points to 54.6 (above 50 means expansion). We are aware of the current economic weakness but we continue to believe that sell-offs will be bought, and that the markets will finish the year higher from today’s levels. Despite Friday’s gain in the DJIA, the week ended down for the fourth consecutive week. After a strong showing in April with a 4% gain for the DJIA, May is likely to end with a loss for the month. The recent weakness in the stock market probably reflects changing forecasts for the strength of the U.S. economic recovery. Last week first quarter GDP growth was confirmed at 1.8% and most economists are revising their estimates for the second quarter from plus 3% growth to 2-3%. 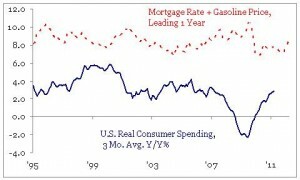 Manufacturing has been slowing, the housing market is struggling and consumer spending has been hurt by higher gas prices. The major economic news this week should be the May jobs report on Friday. Expectations are for 190,000 new jobs and an unemployment rate of 8.9%. 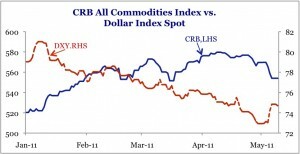 The job picture continues to be the key to this recovery. LinkedIn [LNKD +109%] euphoria produced a Tuesday-Wednesday rally, but was unable to sustain the market for the entire week. The declines ranged from 0.3% by the S&P to 0.9% by the NASDAQ. The YTD figures are still positive, ranging from +5.7% by the NASDAQ to 8.1% by the DJIA. Initial claims fell by 29,000 to 409,000 and continuing claims fell by 81,000 to 3.711M. Overseas, Greece was downgraded by Fitch, S&P warned about Italian debt, unemployment protests rocked Madrid and Iceland is experiencing another volcanic eruption. The US economy is transitioning from recovery to expansion, but at a below average rate. The following chart compares this recovery to the previous six, showing how anemic this recovers is. Corporate earnings reports evidenced continued profit growth, but management’s outlook for the next quarter[s] was for the most part underwhelming. Real Estate indigestion continues as expected. Commodity prices are declining, which will give consumers a break, especially in the gas tank. The current equity softness should be temporary, since modest valuation and continued expansion will prevail. The DJIA (Dow Jones Industrial Average) was down 0.3 percent; S&P 500 was down 0.2 percent; the Nasdaq was unchanged; and the Russell 2000 was up 0.3 percent. Headline consumer prices and producer prices jumped in the latest CPI and PPI readings. Excluding food and energy; inflation is well within the Fed’s mandate. WTI crude closed the week mostly flat but below $100 per barrel. Remember crude oil prices dropped ~ 17% the week before last. 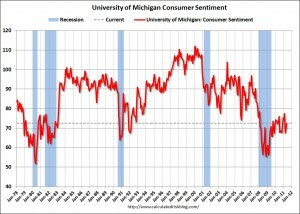 Despite the recent economic headwinds, US consumer sentiment continues to improve…keep in mind that 70% of the US economy still depends on the American consumer. This week’s economic data mostly consists of housing and manufacturing. We expect housing data to remain depressed until the market clears the excess inventory. Manufacturing has been a leader in the recovery but we expect this sector to moderate as our economy moves from recovery to expansion. We would not be surprised to see the stock markets trade down over the next few months but we still expect the markets to finish the year higher from today’s levels. U.S. Treasury bonds continue to rise in price (lower yield), which may also be signaling slower growth ahead. Despite a plethora of headwinds, markets continued their move higher in April with the S&P 500 moving higher by 3.3%. Year-to-date the S&P 500 is up 8.4%. International stocks are beginning to perk-up as well with the EAFE index up 8.4% for the year-to-date period through April. Bond prices have risen 1.7% year-to-date … we expect bond prices to turn lower soon. Earnings season is in full swing, and we witnessed a number of very strong reports over the past few weeks. Adding fuel to the fire, Federal Reserve Chairman Ben Bernanke reiterated the Fed’s stance that rates will stay low for a while. Sooner or later, higher oil prices will impact consumer spending and confidence. So far, the markets seem to be dismissing the substantial drag that higher oil prices will have on the economy. Let’s hope that the issues are just “transitory” as Mr. Bernanke described them recently.